If you live near the Great Lakes, you’ve probably noticed that recently they’ve been better suited to kayaking than ice fishing. 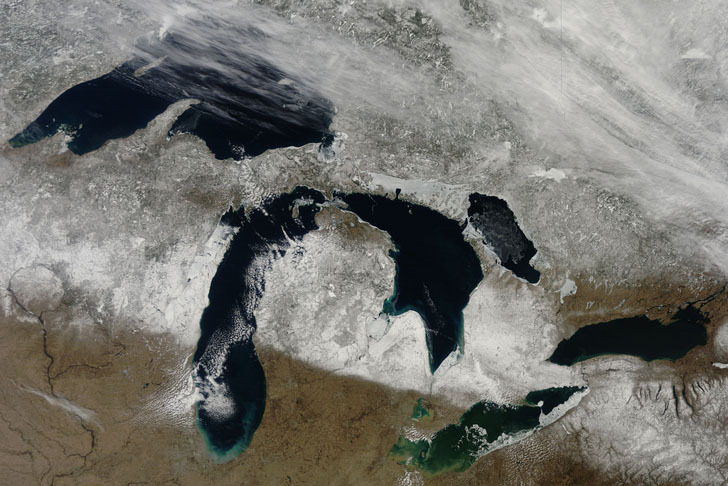 A new report published by the American Meteorological Society now confirms what people living near North America’s greatest fresh water resource have long observed: because of climate change, Great Lakes ice is in severe decline. Using a combination of satellite photos and Coast Guard scanning from 1973 to 2010, researchers found that Great Lakes ice cover has dropped by an average of 71 percent. “There was a significant downward trend in ice coverage from 1973 to the present for all of the lakes, with Lake Ontario having the largest, and Lakes Erie and St. Clair having the smallest,” according to the report. 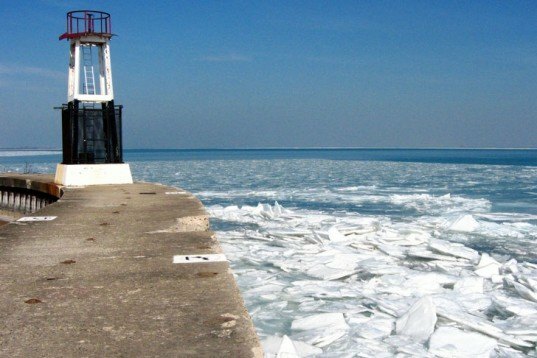 The study’s lead researcher, Jia Wang, from the National Oceanic and Atmospheric Administration, told WBEZ in Chicago that reduced ice can speed up winter evaporation and lead to lower water levels, which can then leave the shoreline exposed and more vulnerable to erosion. The loss of ice can also signal earlier algae blooms, which harm water quality and the marine habitat. The study doesn’t take the most recent winter into account, but the trend is continuing. According to the Duluth News Tribune, only about 5 percent of the Great Lakes’ surfaces froze this winter — well below the 40 percent average. Further proof: In Buffalo, the ice boom was removed from Lake Erie in late February, the earliest on record since the boom was installed in the winter of 1964-65. If you live near the Great Lakes, you've probably noticed that recently they've been better suited to kayaking than ice fishing. A new report published by the American Meteorological Society now confirms what people living near North America's greatest fresh water resource have long observed: because of climate change, Great Lakes ice is in severe decline. Using a combination of satellite photos and Coast Guard scanning from 1973 to 2010, researchers found that Great Lakes ice cover has dropped by an average of 71 percent.